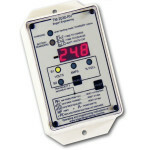 The TM-2030 battery monitor provides a high degree of insight into your battery system. Although it will monitor the activity of any charger or solar charge controller, the monitor is designed to work with our SC-2030 Solar Charger and WF-2030 to offer significant control over the charging process. and thus, extend battery life. 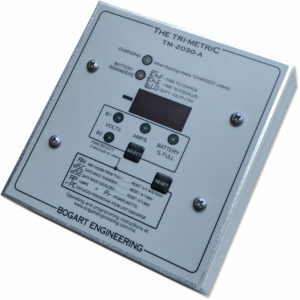 To purchase the TM-2030 or the SC-2030 directly from us or to learn about our current sales promotions please contact us. The TM-2030-A and TM-2030-RV are operationally identical to each other. The difference between the “A” and “RV” version is only the size . The TM-2030-RV is smaller and includes the enclosure shown. The TM-2030-A mounts in a double gang electrical box (not included), and is easier to flush-mount. ●Highly capable battery monitor, monitoring important vital statistics of a battery bank. ●Measures battery % full, based on amp hour measurements for accurate information on state of charge (SOC). This method is more accurate than monitors that use only voltage to determine how full your batteries are—especially when they are between 30-90% full. Battery system size: 10-10,000 amp hours. ● Measures battery charging or discharging amps (or watts); Verify chargers are working properly, view loads and how much current they are drawing, and check for phantom loads you may not have been aware of. ● Measures battery volts (9.0 to 75): to verify that chargers are charging to correct voltage for your batteries. ● Audible low battery alarm, based on volts and % full. May be silenced. ● Measures days since charged: Shows how many days have elapsed since batteries were last fully charged. Batteries can lose their ability to hold a charge if they are not fully charged on a regular basis. ● Shows days since equalized: A reminder to equalize at appropriate time if you perform manual equalizations. ● Displays replaced percentage of charge, compared to most recent discharge–Many battery company experts are now recommending that when recharging, 110-120% of recently withdrawn energy should be replaced for wet cell lead acid batteries to prevent loss of capacity—and 104-108% for AGM types. This new function makes it easy to determine if they have been sufficiently charged. ● Easy to read display–display may be turned off. ● Defaults to “Level 1” for most users to keep operation simple. Choose Level 2 or 3 for more technical users or for use with the SC-2030 charge controller. ● View logged history data: Helpful to verify your system is working properly. ● Length of the cycle. ● How long ago the cycle ended. Data for each of the last five days. ● Highest voltage that day. ● Total percentage overcharge for that day. ● Sizes: smaller (RV) is 3 x 5-1/4 x 1-3/8 inches deep. Larger (A) is 4-1/2 x 4 -3/4 x 1-1/4 inches deep. ● Requires one of two shunts: 500A/50mV shunt allows amp measurements from 0.1-over 400 Amps. 100A/100mV shunt allows amp measurements from 0.01- over 70 Amps. Larger shunts allow higher current limits. 1000A/100mV shunt (rarely used) may be used (with the “H” shunt setting).